Deep in the internet’s bowels you can find statistics to back up just about any argument or theory. Babycenter.com has collected a bizarre range of survey results on a huge range of parenting subjects. Access them here. There’s facts about everything from brands of breast pumps to life insurance policies, but of course it’s the nutrition and food topics that pique my interest. One survey asked 4000 moms to rate the importance of several factors when cooking for their families. The two most important factors were taste and nutrition. Yay! Congratulations to all of you mums who don’t want to compromise on flavour, even when faced with fussy feeders. Another interesting result was that 51% of mothers were prepared to cook two dinners each night just to keep the peace. I understand how this situation evolves, but I just refuse to do it! I try to make all my recipes healthy and packed with vegetables, so we feel good about feeding them to the kids but with the addition of a couple of ingredients, the adults can enjoy a delicious meal too. A good example is these lamb meatballs – the feta makes them very more-ish and they can be adapted to suit everyone. Plus, they cook in the oven, avoiding a big revolting mess, because cleaning up more than I have to is also something I refuse to do. Don\’t cook two dinners, these lamb & feta meatballs will please everyone. Preheat oven to 200C. Line a large oven tray with baking paper. For the meatballs, combine all the ingredients in a bowl. Use your hands to mix well, then roll into bite-sized balls and place on an oven tray. Spray meatballs lightly with cooking spray and bake for 10 minutes. Use tongs to carefully turn over, spray with more cooking spray and bake for another 5-10 minutes until cooked through. Meanwhile, cook the pasta in a large saucepan of boiling water according to packet directions, then drain. While still warm, toss through the remaining ingredients. 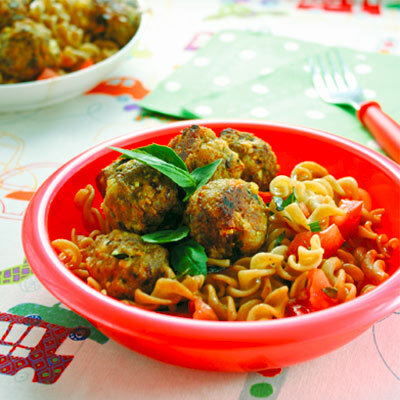 Serve the pasta in bowls, topped with meatballs. Sprinkle with basil leaves. FOR THE ADULTS Add extra ingredients to the pasta salad. Try olives, chopped anchovies, spinach leaves, toasted pine nuts and dried chilli. I am one of those who go online trying to solve problems. I tried to make food taste good and healty at the same time. And really these online recipes seem to work really well in my family…just like this recipe sounds so delicious. My family will love this. Loving this site very much, thank you. yep, that’d be nice. These meatballs are pretty versatile. also good cold in lunchboxes. Hi Wendy, I’ve adapted the meatball recipe into burger patties using beef mince, and my kids love them! All those vegies devoured… Thanks for the inspiration! Fab-o. Always happy for people to adapt as suits. Wondering what to make for dinner tomorrow…this will do nicely! Thanks!!! Made these tonight. They taste great. Little one having them on their own with some vegies and I’ll have them with a tomato passata sauce and wholemeal pasta. Can the meatballs be frozen? I must admit I am one of those “restaurant” Mums e.g cook 4 meals a night to keep the peace. I am vegetarian, my husband is carniverous, Miss 7 has sensory and muscle tone issues and Misses 6a and 6b are extremely suss of anything green or slightly vegetable-y! you’re a good woman to be that dedicated to your family! Hope it goes well! Great recipe Wendy! My hubs devoured them for dinner, took more for lunch and then whined when he came home and the twins had eaten what was left for afternoon tea lol. It was probably the most versatile dish I’ve ever cooked that everyone could eat or eat most of!